These guns are all hand-made replicas of real guns...only they're shrunken and miniaturized 4 to 4.5 times the regular size. 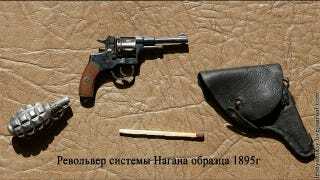 Alexander Perfiliev, the master minigunmaker, has been building these beautiful guns for 30 years. Perfiliev spends an insane amount of time perfecting every detail of the gun. There's a Mauser, an AK, Smith & Wessons, pistols, revolvers, everything, really. He's made 50 different models over the past 30 years with each model taking anywhere from half a year to a year.